The Literary Association (Tamil) activity was conducted on 30.12.2016 at Keerthi Hall at 2.00 pm. The activity began by invoking the presence of almighty through the prayer song. Ms.S.Hamshamalini of I-B.A English welcomed the gathering. As a part of the association activity Tamil Vivatha Medai was conducted on the topic "Demonitisation" for the students of Paavai Institutions. Some of the participants argued the need of demonetization in India as it helps to tackle black money in the economy. It will lower the cash circulation in the country which is directly related to corruption and to eliminate fake currency. They also strongly claimed that the dodgy funds which have been used by terror groups to fund terrorism in India. Some other students opposed demonetization stating that the government's lack of preparedness to deal with cash availability has hit the common man really hard. Despite the government's assurance to improve cash availability on a daily basis, several banks and ATMs across the country continue to dispense little or no cash. People in villages and semi-urban areas are worst hit as majority of the transactions are done through cash. 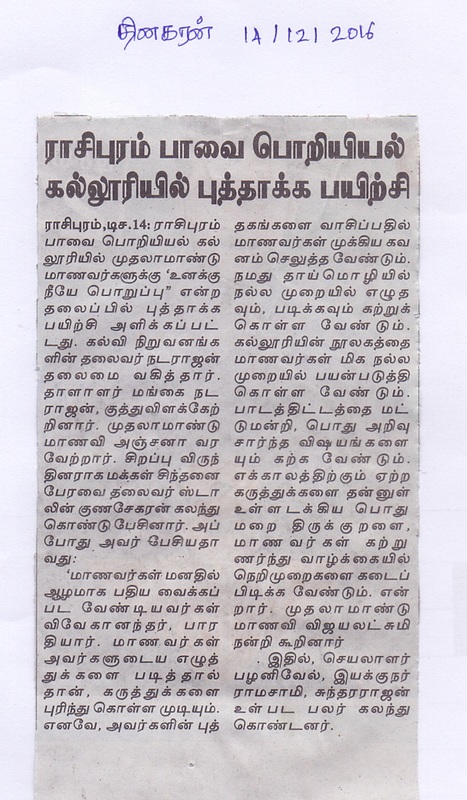 Dr.K.Umamaheswari, HoD, Department of Tamil acted as the judge. In her verdict she stated that the move will help curb black money in the economy. This move will definitely bring about a whole amount of transition to no cash or low cash kind of transactions. She concluded that people of India will positively enjoy the fruit of this change soon if they join their hands with the government's move in its fight against corruption. The First year and Second year students of Pavai Arts and Science College for Women were the audience of the Programme. The participants boldly expressed their views regarding the topic. Dr.K.Umamaheswari, HoD Department of Tamil appreciated the participants for their effort and enthusiasm and encouraged the students by distributing prizes. The Programme came to an end with the vote of thanks proposed by Ms.P.Roja of I-B.Sc.Chemistry.